iticulture was more important in Victoria than in either So>uth Australia or New SouthWales in the 19th century but the arrival of phylloxera triggered a decline for much of the state. In the late 1960s the first steps were taken towards a revival that has rapidly gained pace since the early 1980s. 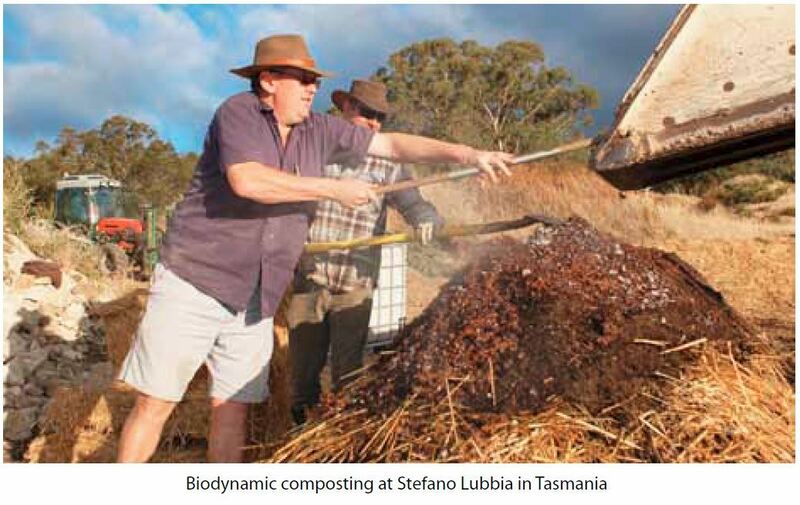 Victoria offers a diversity of site and climate permutations arguably unequalled in Australia, while much more is being made of Tasmania’s cool climatic conditions. As an example of an increasing regionality, Heathcote Shiraz and Tasmanian Pinot Noir – which previously only boasted isolated successes – are now emerging as two potentially outstanding regional styles following a mini-explosion in quality. For Pinot Noir, Mornington Peninsula is also emerging as one of the country’s finest regions for the variety while in the more established Yarra Valley, producers are exploring sub-regionality with interesting results.Other regions such as Henty, Gippsland or Macedon Ranges also seem set to gain wider recognition amongst consumers of quality wines. The most productive area of Victoria, its regions of Murray Darling and Swan Hill are shared with the Big Rivers zone of New South Wales. It makes a significant contribution to Australia’s big volume brand production from highly mechanized viticulture and winemaking.While the grapes from these high yielding irrigated vineyards are never going to produce wines of real quality, they can be sound as well as inexpensive and are usually much better than the equivalent from most other bulk wine producing areas around the world. at all. One of the strengths of Victoria is the great diversity of Shiraz styles, with top class examples from Henty, Grampians, Pyrenees and Bendigo, the latter in Central Victoria. Grampians (or Great Western as it used to be known), another survivor of Victoria’s 19th-century viticulture, has long been famous for its Shiraz including one of Australia’s very best fromMount Langhi Ghiran. Elevation makes it cooler than might otherwise be expected, as is the case with the rolling hills of Pyrenees where both Shiraz and Cabernet Sauvignon are made, to very high standards in the case of Dalwhinnie and now Michel Chapoutier and Anthony J. Terlato. . Chardonnay can also be impressive. The Henty region is still little known but encompasses a large area in the south-west corner of Victoria. There are climatic and soil similarities with the Limestone Coast (in South Australia) which lies but a short distance to the west. 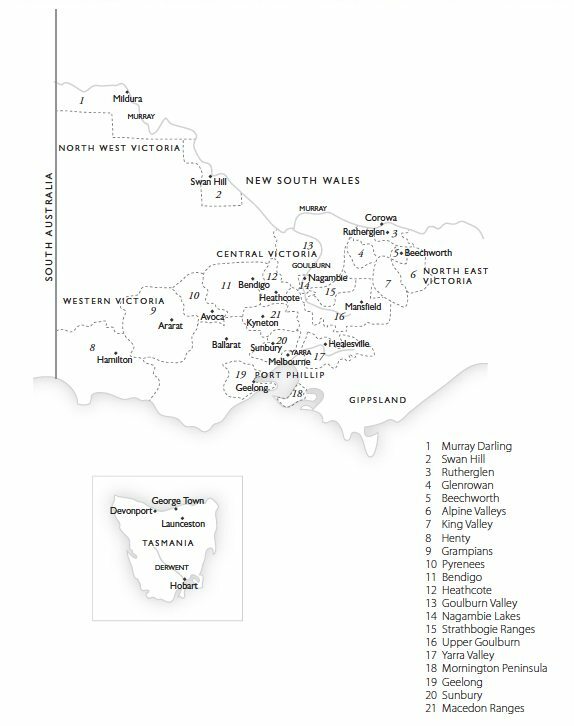 Around the towns of Rutherglen and Glenrowan is the most significant area of Victoria viticulture to have survived its fall. Unique, intensely sweet fortified wines made from raisined Muscat and Muscadelle (once labelled Tokay but now being sold as Topaque) grapes are often subject to long ageing in hot conditions. A classification of the Rutherglen wines has recently been introduced. Beyond a basic Rutherglen category, in ascending order, are the Classic, Grand and Rare quality levels. Robust, earthy reds are also made from Shiraz, Durif and Cabernet Sauvignon. The heat of Rutherglen is in contrast to the cooler areas to the south-east. Beechworth has forged a reputation for fine Chardonnay and Pinot Noir thanks to Giaconda, but Rhône varieties are exciting too, especially at Castagna. Meanwhile, in the Alpine Valleys (including Ovens Valley) and King Valley, vineyards extend from the heat of Milawa into the lower reaches of the Australian Alps, part of the Great Dividing Range, where altitude is critical to cooler-climate viticulture in New South Wales. A wide range of grapes is grown but an unusual development is the propagation of Italian varieties. As Drumborg, it is more familiar as the source of the fine sparkling wines produced by the region’s pioneer, Seppelt. Riesling and Pinot Noir also show much promise. Bendigo is now synonymous with great Shiraz, particularly the examples from the now separate region of Heathcote. In fact, Bendigo achieved fame for its Shiraz in the 19th century and this is once again a very exciting area with a recent surge of new wines set to challenge the leading estate of Jasper Hill. In Goulburn Valley another pocket of Victoria’s wine production has been maintained. The region is vast, but the best producers are concentrated in the south, in the subregion of Nagambie Lakes, an area not a great distance east of Heathcote. Shiraz is brilliant from its leading producers, Tahbilk and Mitchelton, but Cabernet Sauvignon and Riesling as well as Marsanne and other white and red Rhône varieties are beginning to excel. Vineyards in the Upper Goulburn and Strathbogie Ranges are most suited to aromatic white varieties. 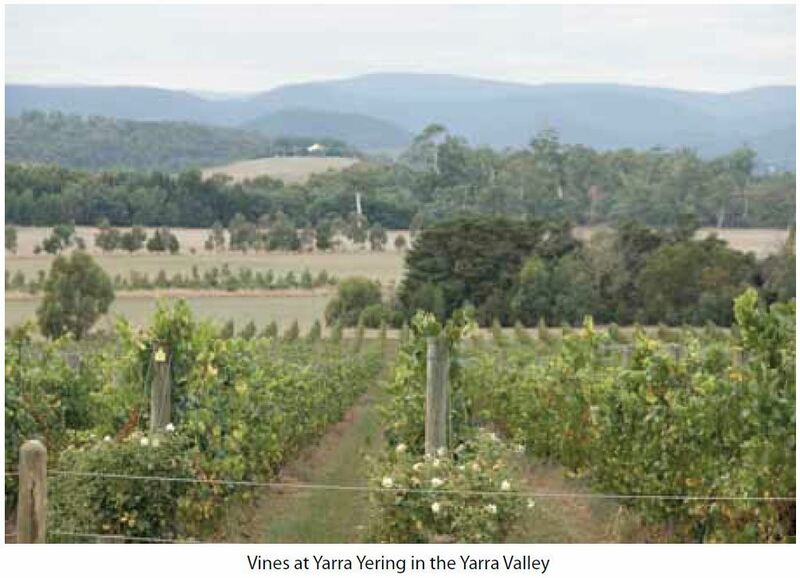 The leading region among those lying close to the state capital of Melbourne is the Yarra Valley. First developed in the 19th century, its modern revival dates from the 1960s.Within its substantial confines there exist any number of mesoclimates but it is generally cool and damp by Australian standards. The Yarra Valley provides great examples of Pinot Noir and Chardonnay but also fine Bordeaux blends, though there can be a struggle for ripeness in cooler vintages. Shiraz is less important but of high quality from the likes of Yarra Yering. The best wines are fruit-rich but softly textured and stylishly complex, though there is a trend in favour of more restrained, medium bodied wines designed better to showcase vineyard character. There is also fine fizz although most examples include grapes sourced from outside the region. The Port Phillip zone also includes Geelong, Sunbury and the Mornington Peninsula. Geelong, thanks mostly to Gary Farr, formerly of Bannockburn, now of By Farr, has a reputation for intense, powerful Shiraz, Pinot Noir and Chardonnay. The same theme is echoed in the cool Mornington Peninsula whose many small producers, though focusing on Pinot Noir and Chardonnay, now among the country’s best, can produce elegant, stylish Shiraz too. Similarly in Sunbury but more especially the higher-altitude Macedon Ranges, quality from Chardonnay and Pinot Noir can be outstanding. Bindi is the star but others are challenging. Other reds are at the margins for achieving full ripeness yet wines such as Craiglee’s Shiraz or the Virgin Hills Cabernet Sauvignon-based blend can be super in the warmest vintages. Gippsland is a vast, cool zone in the south-east of Victoria with some exceptional isolated pockets of vineyards, but its marginal climate is always likely to deter all but a mad few. Yet quality can be very high even if quantities are scarce. Try to find the Pinot Noirs of Bass Phillip and young Turk William Downie who also makes Pinot Noirs from the Yarra and Mornington Peninsula. Across Bass Strait in Tasmania, the cooler, wetter climate has deterred the industry giants from invasion and its modern development has only really taken off in the past decade. The once dominant Pipers Brook group is no longer the only sizeable player given Tamar Ridge’s rapid expansion. What is more, Constellation’s investment in Bay of Fires and the recent acquisition of Tamar Ridge by Brown Brothers signals that major mainland producers are no longer content solely to source grapes from the island. Nonetheless, there are now dozens of tiny holdings from which tiny quantities of increasingly fine Pinot Noir are produced by a just a few talented winemakers. Riesling and Chardonnay are also successful, the latter important (with Pinot Noir) in the island’s flourishing premium sparkling wine production. There is also a greater focus on aromatic white varieties other than Riesling, especially Sauvignon Blanc and Pinot Gris/Grigio.